Automation helps you automatically trigger an action when a specific event occurs. Automated actions work according to an 'event > action' logic: when a pre-determined event X happens, a pre-determined action Y will occur automatically. An event is something that happens on Pipefy to trigger the automation action. 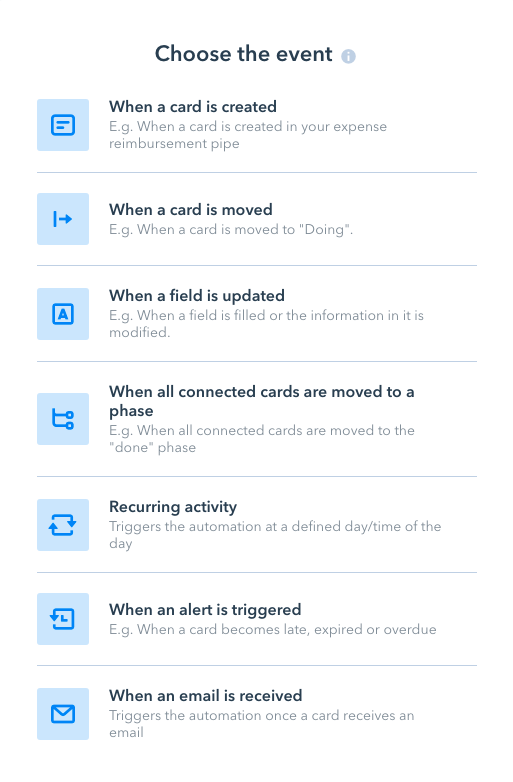 Example: Every time a card is completed on your Sales Pipeline. In this case, the event is “when a card is moved" to phase done. The action is what happens after the automation is triggered. 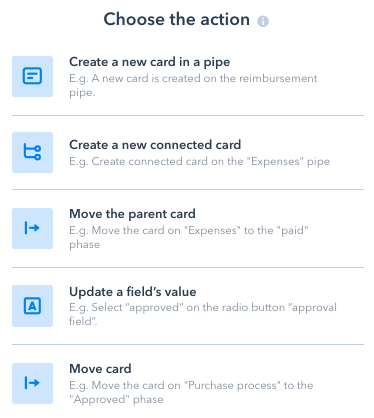 Example: Every time a card is completed on your Sales Pipeline, a new card is created in the accounts receivable pipe. In this case, the action is “create a new card”. *. When setting up a recurring activity, the time you choose is UTC, which means that if you want cards to be created everyday 7 a.m. your time, you need to check your time zone and add/subtract the difference from UTC. Move card: A card will be moved to a specific phase in the same pipe where the action happened. How to set up automations? How to set up automation conditions? How to create automated approval flows? How to smartly delegate tasks using automations? How to track subtasks using automations?